Science Project _ How does temperature affect the elasticity of rubber? Natural and synthetic robbers with many different compositions are used in many machineries and equipment. The elasticity of rubber makes it a perfect choice for products such as washers, tubes, tires, balls, joints, pads, boots, hoses, and bands. 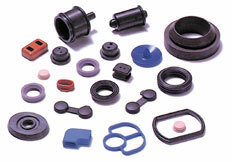 Most polymers have little resistance to high temperatures. Polymers used in household plastic products tend to melt, deform, decompose or burn in high temperatures. Many rubber parts used in water taps, automobiles and other machineries are exposed to heat from hot water, hot oil or holt metal parts. The question is "How do rubber products react in high temperatures? "; How does temperature affect the elasticity of rubber? In this project you will study the effect of heat on rubber. You will design experiments to see how heat affects the physical properties of rubber. You will finally present your results in the form of a table or graph. More details or support on this project is available for the members ScienceProject.com. Material needed for experiment may be found at home, obtained locally or purchased online.